Coverage: Live commentary on Radio 5 live sports extra plus live text on the big matches on the BBC Sport website and app. 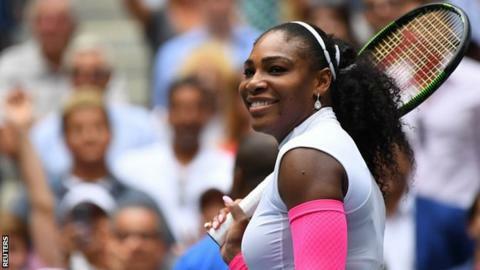 Serena Williams powered to a record 307th Grand Slam match win to reach the fourth round of the US Open. The world number one moved ahead of Martina Navratilova for most match wins in a major by a woman, and tied Roger Federer's mark for men with a 6-2 6-1 victory over Sweden's Johanna Larsson. "That's pretty awesome and what a place to do it, where everything first started," said the 34-year-old. Serena won her first Grand Slam title at Flushing Meadows in 1999. "To be up there with both men and women is something that's super rare, and it actually feels really good," she added. The American is bidding to claim a 23rd Grand Slam singles title, which would see her surpass Steffi Graf as the most successful woman in the Open Era. The six-time US Open champion, whose number one ranking is under threat, next faces Kazakhstan's Yaroslava Shvedova, a 6-2 7-5 winner over China's Zhang Shuai. Sister Venus Williams, the sixth seed and oldest woman in the tournament at 36, also went through with a 6-1 6-2 win over 26th seed Laura Siegemund of Germany. Venus, who won back-to-back US Open titles in 2000 and 2001, will compete for a quarter-final berth against Czech 10th seed Karolina Pliskova, who beat 17th-seeded Russian Anastasia Pavlyuchenkova 6-2 6-4. She will meet her sister Serena in the semi-finals if both continue their winning form. Fifth seed Simona Halep of Romania smashed her racquet in frustration before avoiding an upset by defeating Hungary's Timea Babos 6-1 2-6 6-4. Halep trailed 3-1 in the deciding set but fought back to reach the last 16. "I don't know how I came back. I felt like I didn't play my best but I was fighting to the end for every ball," she said. Halep will play Spain's 11th seed Carla Suarez Navarro for a place in the quarter-finals. Suarez celebrated her 28th birthday with a 6-4 6-3 victory over Russian Elena Vesnina. Fourth seed Agnieszka Radwanska of Poland overcame France's Caroline Garcia 6-2 6-3 and will face Ana Konjuh of Croatia next.